Our newest album, L’Chaim, features 32 new Bar Mitzvah and Bat Mitzvah invitations from Checkerboard. We are so sure you’ll love the stellar styles and quality materials that we are offering 25% off your purchase price with the coupon code MITZVAH25. Now that’s a deal :). To learn more about the invitations featured in this collection, read this post about new L’Chaim Mitzvah Invitations, watch our feature video, or shop our new Bar Mitzvah and Bat Mitzvah invitations today. The Desert Rose Bat Mitzvah Invitation is rustic, dainty, and glamorous rolled into one perfect invitation! 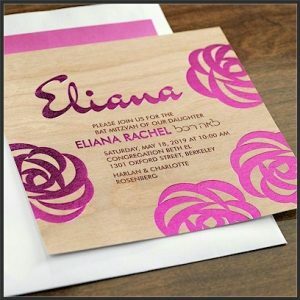 Genuine wood stock, large floral foil stamped motifs, a unique square shape, and bold text features make this invitation sing. The Kinetic Energy Bar Mitzvah Invitation is full of just that — energy! 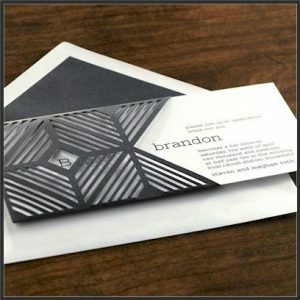 Bright White card stock and an intricate Jet Black laser die-cut jacket leave a lasting impression. Customize this invitation with your choice of ink colors, lettering style, your Bar Mitzvah’s name, and the details for your celebration. An invitation with simple elegance, the Aria Bat Mitzvah Invitation in Champagne Shimmer wows with subtle details. 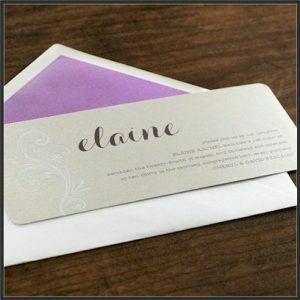 Rounded corners and an elegant white foil stamped flourish motif create the perfect invitation for your Bat Mitzvah who loves all things pretty and sweet. Combine the dramatic with gentle vibes when you choose the Flux Bar Mitzvah Invitation. 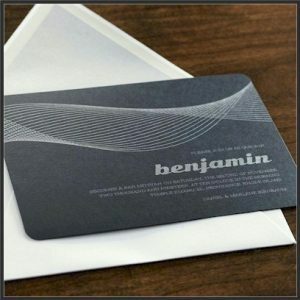 Dramatic Jet Black card stock decorated with a gently flowing Matte Silver line pattern effortlessly showcases your Bar Mitzvah and wows guests. 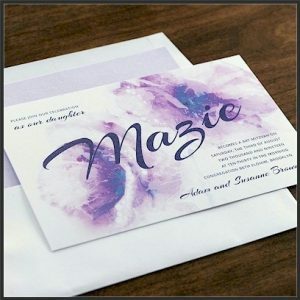 Elegant, soft, and pretty — if these three words describe your Bat Mitzvah, the Aquarelle Bat Mitzvah Invitation is the perfect choice for you. 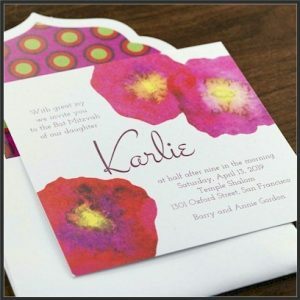 Bright White card stock is dolled up with two floral watercolor designs in shades of pink and lavender laced with touches of aqua. An artful wording arrangement puts the finishing touches on this work of art. 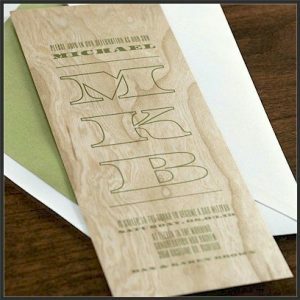 Naturalists swoon over the Carved Bar Mitzvah Invitation. Genuine Wood stock decorated with a stately 3-initial monogram and personalized details creates a handsome display that’s perfect for spring and summer celebrations. A pop of color and style create a joyful design in this contemporary Bat Mitzvah Invitation. Bright floral motifs, artfully arranged wording details, and thoughtful design accents make this invitation truly dazzle. 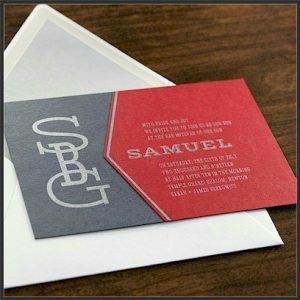 The Fulcrum Bar Mitzvah Invitation features your Bar Mitzvah with a stylish monogram and shimmery finish. This display features Moonrock Shimmer and Grenadine Red, but other color options are available for customization. 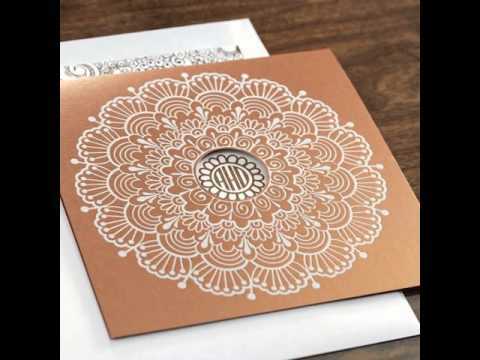 The Paper Lace Bat Mitzvah Invitation is the perfect choice for ultra feminine Bat Mitzvahs. 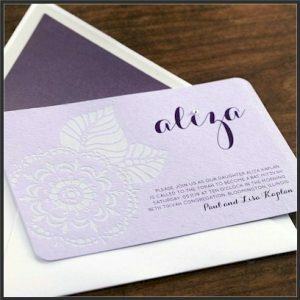 This dainty invitation features beautiful purples, rounded corners, a large floral motif, and your Bat Mitzvah’s decorative name topped off with a genuine Swarovski crystal. If you love this small sample from our new L’Chaim Checkerboard collection, browse our entire collection of 32 new Bar Mitzvah and Bat Mitzvah invitations! You can also watch our feature video to see all of our beautiful invitations. Once you find one you like, remember to use the coupon code MITZVAH25 for 25% off your online order. Can’t get much better than that :). This entry was posted in bar-mitzvah-invitations, bat-mitzvah-invitations. Bookmark the permalink.